Want to design a bathroom that’s modest in size but big on aesthetics? You’ve come to the right place. Large bathrooms are great, there’s no getting around that. More space to play with means dramatic freestanding baths, elegant exposed pipework, ambitious tiling – you name it, big bathrooms can pull it off. But what you can do if you have a small bathroom? Well, here’s your guide. Vintage style bathrooms are trendy, but toilets with an old-fashioned flush (like this one) can take up a significant amount of space. The plumbing also requires a closer look. If you’re installing a new bathroom or performing a complete refurb on an existing space, it’s a sensible idea to consult a professional. Having a consultation with a plumber or handyman who specialises in bathrooms to understand your options is a good starting point. 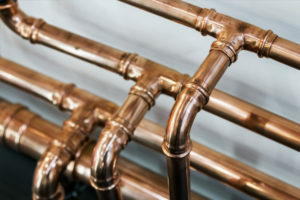 If you’re fitting a new bathroom, the floorboards will almost always be lifted to install pipework, and if you want a radiator, you’ll have to connect this to an existing radiator system. The layout is the first thing to consider when making the most out of the available space. Bear in mind that you’ll need space at the edges of any new installation, for example, always leave 2-3 inches of space at the side of your bath to ensure you can get it installed without any issues. 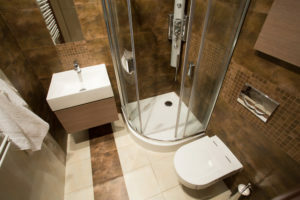 Whether you’re installing a new bathroom in your home, or you’re giving a dated room a refresh, limited space throws up a bunch of difficult design and layout decisions. First, you have to know what you’re dealing with. The first job on the list is measuring the dimensions of the room. Make detailed notes of the length of the walls and ceilings, then estimate what you’ll be able to fit into that space. If you’re low on space, a shower enclosure that opens out into the room is going to be a problem. Sliding door shower enclosures are perfect for these occasions, as they don’t require any additional room to operate. If you’re really low on space, scrap the enclosure altogether and install a wet room. The standard size of a bath in the UK can vary, so a smaller bath might be a good option if you’re set on one (alternatively, scrap a tub in favour of a shower). A freestanding bath doesn’t need to be off the table, either. Some freestanding tubs can sneak into smaller spaces, but won’t enjoy as much free space around them (which can reduce their visual appeal a little). A corner sink is a handy way of being economical on space whilst adding a quirky touch to your bathroom. 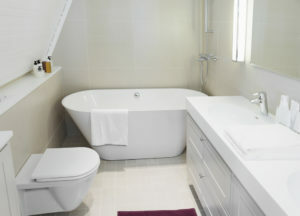 Corner sinks only take up minimal space, and be installed into tiny toilet rooms or very limited bathrooms. Sorting out your bathroom storage is another part of designing the perfect small bathroom (we’ve explored this in detail in our storage ideas for small bathrooms post). Investing in the wrong vanity unit can spell disaster for your space. Sharp edges jutting out, or bulky units that struggle to slot under the sink can make organising the layout of your room difficult. A vanity unit that’s built into your sink can be a handy way of introducing some storage into a limited area.